Aujourd’hui j’aimerais vous raconter mes résolutions pour l’année 2019. Pour commencer je veux que vous sachiez ce que j’ai appris par rapport aux langues. Je n’ai pas ajouté d’autres langues. En fait, j’ai beaucoup pratiqué les cinq langues principales : L’allemand, l’anglais, le français, l’espagnol et le suédois. Ces sont les langues que je parle le mieux. Je me suis concentré sur ces langues. J’ai négligé un peu le portugais et le néerlandais. Pourquoi ? Parce-que je me suis dit que si j’améliorais mon espagnol et mon suédois, en 2019 je serai capable de me concentrer sur le néerlandais et le portugais car ces langues sont très similaires. Le plus grand brochet que j’ai péché en 2018, c’était un femelle de 96 cm. Même si j’ai investi 150 heures, je n’ai pas réussi à pécher mon brochet d’un mètre. À la place, j’en ai péché quinze plus petits. Cependant, j’ai péché un poisson d’un mètre, mais c’était un silure, pas un brochet, qui mesurait 1,12 m.
Je vous tiendrai au courant de mes progrès. Quand j’aurai réussi mon but de pécher un brochet d’un mètre, je vous informerai. Bonne année ! Merci à tous les lecteurs qui lisent mon blog ! Idag skulle jag vilja skriva på svenska. Det här inlägget handlar inte om språk utan om att fiska. Jag älskar att fiska gädda, och för två veckor sedan fiskade jag upp en stor gädda som var 83 cm. Om du vill göra detsamma så kan jag berätta lite om hur jag gjorde. Först måste man veta vad gäddor äter. Gäddor är köttätande, vilket betyder att de äter andra fiskar, men också sina artfränder. Dessutom måste man imitera en fisk. På marknaden finns det många plastfiskar. Här är några beten som jag tycker fungerar bra i Schweiz. Om du bor i ett annat land fungerar de också där, inte bara här. 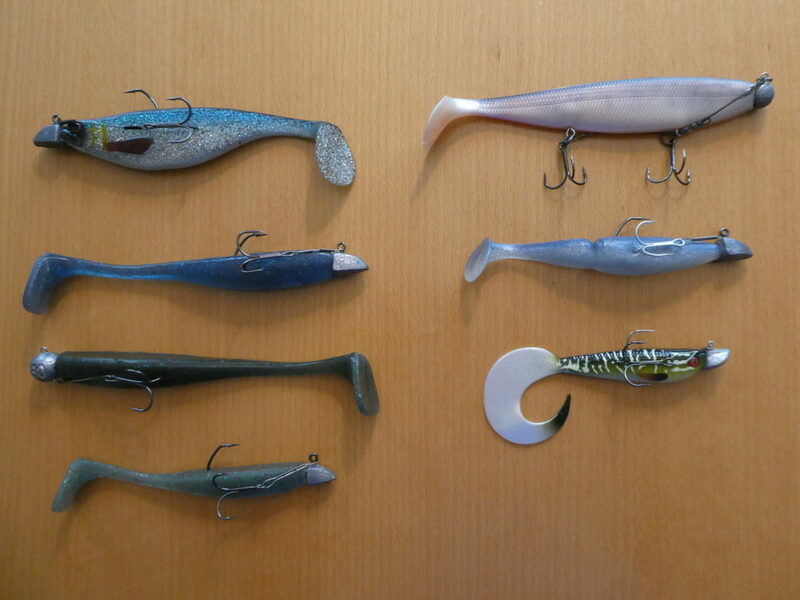 På bilden kan du se en Westin Shad Teez, några Ivy-Baits, en Fox Rage Natural Classic Shad, en Sawamura One Up Shad och en Fox Twister. 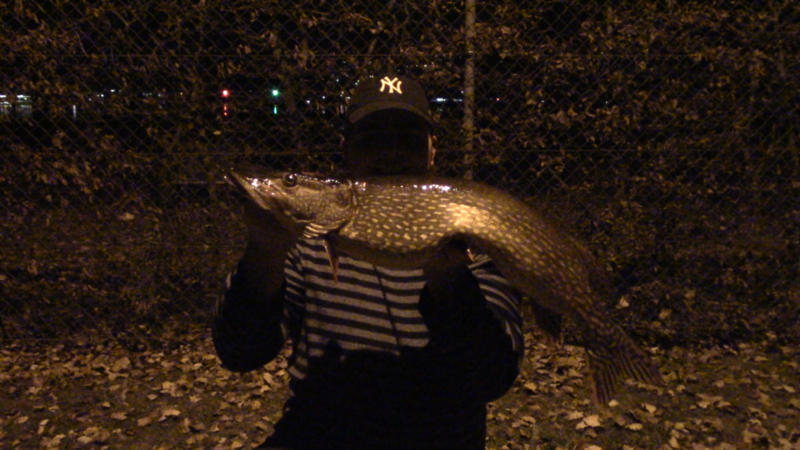 Min gädda på 83 cm tog den blåa Ivy-Baits Shad 16 cm. Hur lyckades jag lura den vackra gäddan? Jag fiskade i en älv när det var mörkt och kastade ut beten. Jag lät betet sjunka till botten där gäddorna oftast är. Jag tog in betet och ryckte i det 4-5 gånger, lät det sjunka i fyra sekunder, ryckte i det 4-5 gånger igen, och väntade tills jag kunde känna botten. Jag lät bara betet sjunka till botten varannan gång, för att undvika att få sjögräs på kroken. Jag gjorde detta så länge jag kunde tills jag kastade ut betet igen. Efter några timmar kunde jag känna att en fisk nappade på betet. 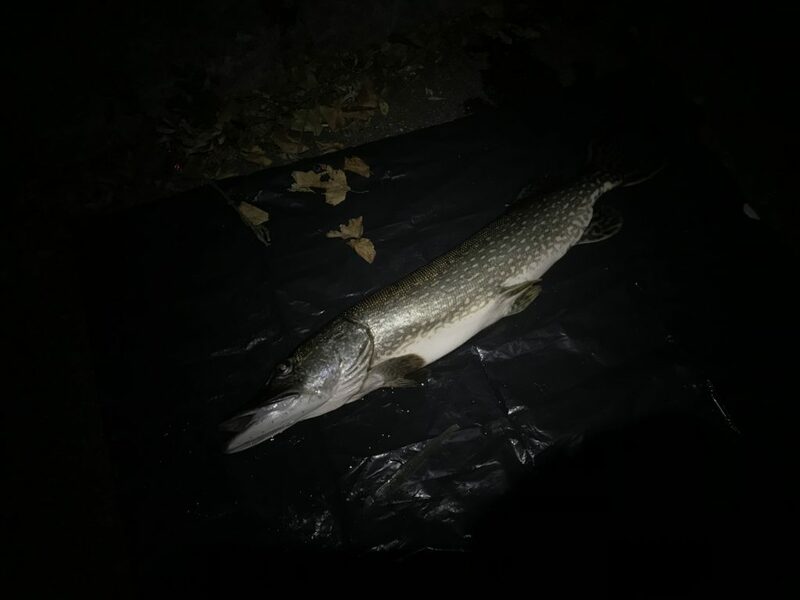 Jag drog direkt upp spöet för att få fisken på kroken. Det kändes bra. Efter en halv minut såg jag att det var en stor gädda och då blev jag glad. Den vägde ungefär 3 kg. Vi åt den och jag måste säga att jag gillade den väldigt mycket. Min dröm är att fiska en gädda som är över en meter. Nu investerar jag mycket mer tid i det. Jag önskar er lycka till med att fiska er stora gädda. Ultreya, y buenos días a todos mis lectores. Sin duda, un políglota tiene que enfrentarse a dos desafíos: aprender nuevos idiomas y conservar y no olvidar ninguno de ellos; porque si uno no usa el idioma que aprendió, lo olvida y… ¡mucho! Para dar un ejemplo, si uno no cuida su jardín regularmente, la verdura se daña. Para no olvidar mi español, me escribo regularmente con un “pen-pal”, es decir, un amigo con quien intercambio dos idiomas: alemán y español. Yo siempre escribo en alemán y él en español. Además, hablo por lo menos una vez por semana con alguien en el idioma español. Puede ser un tutor o profesor de italki o alguna otra plataforma. También, siempre me corto el pelo en una peluquería española. Así, no olvido mis conocimientos en el idioma, y aprendo mucho más. Entiendo que ya es difícil mantener cinco idiomas. ¡Imagínese diez! Yo, dependiendo de lo que signifique hablar, diría que hablo cinco a un nivel bastante alto, y hablo otros dos también, pero no con una fluidez increíble. Mi consejo es: “Pasito a Pasito, suave suavecito” como dice Luis Fonsi en la canción “Despacito”. Viva el idioma. No sólo es aprenderlo y luego olvidarlo. Use el idioma a lo mejor dos o tres veces por semana. Los idiomas son herramientas increíbles para comunicarnos con los demás, y hay que conservarlos en nuestros cerebros, porque son un tesoro de la humanidad. Let’s say you want to win the lottery, and have already wasted hundreds of dollars trying to win it. If you keep doing that, it’s very likely that you’ll end up having spent thousands of dollars without any reward. Think about the fact that language learning is not that expensive. It can be expensive if you have to pay teachers, etc. But if you buy yourself a course, speak to friends, do tandems, use the internet, it’s almost free. And you can win the lottery by doing that. What do I mean by winning the lottery? Well, instead of filling your wallet with money, you fill your brain with words. The things you’ll experience cannot be replaced by money. Learn a language, or even two, three or more over the course of some years. A lot of people say that it’s possible to learn several languages at the same time. My suggestion would be to not learn more than two simultaneously. What would you do if you had to learn five languages over the course of ten years? Would you start tackling every single one at once, or would you start with one, and then add a language every two years? I would go for the latter example because it makes more sense to me. Choose a language. Make sure you like the sound of it. Make a list, write down 10 reasons why you want to learn this language. You should read them when you don’t feel like studying anymore. Start small. Spend more and more time with the language, and do it regularly. It’s better to do 30 minutes a day than to spend an entire Sunday studying your target language. I can assure you, it will change your life. It will change your perspective, the way you see things. You’ll start to understand more and more things, and probably even get a better job with a better salary. One final tip: the earlier you tackle difficulties, the easier it gets. 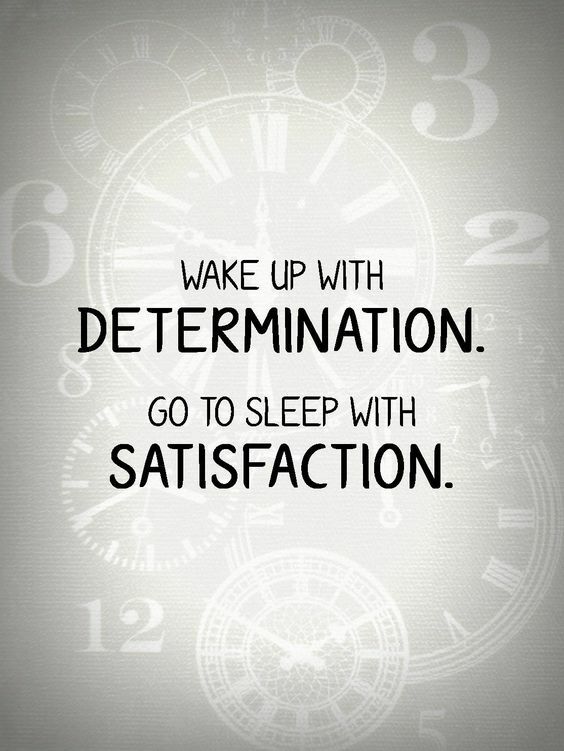 The bigger the effort, the bigger the reward. I wish you all good luck with your studies! As the title says, in this article I want to convince you that you can learn any language, even if it’s an extremely different language to your own native tongue. Do you believe me? If not, let me break it down for you. I was born in Rome, Italy. After four months there, my parents decided to move back to Switzerland. Had I stayed there, I would have obviously learned Italian. Until now I cannot hold a conversation in Italian because I’ve never learned it. The same goes for any child born somewhere in the world. Let’s suppose you were born in Sevilla, Spain. After eight months in Spain, your parents got a job opportunity in Japan. They both grew up in Japan, speak fluent Japanese and now they move back there. At home in Japan, they’d only speak Japanese with you, so you’d lose your Spanish completely. Your brain would have adapted itself to the envirement, to the language that’s being spoken where you live, to the language that flows in and out of your head. Do you get it? You can learn any language, you just need to expose yourself to it. It doesn’t matter how different the language might be to your native one. You can learn Vietnamese, Xhosa, Thai, Mongolian, Finnish, Somali, Zulu, really any language. There are no limits. You can learn whatever you want if you have the proper mindset. Attitude is altitude. Don’t let anybody set your limits. Someone’s opinion on you does not have to become your own reality. The only limits are those that you set yourself. Dream big, think big, but start small, that’s right, start small. Step by step, inch by inch, minute after minute. I wrote an article a few months ago called ,,How attitude affects language learning”. Head over to the front page to find the post listed among others on the right. Please tell me in the comments what language you’re going to learn now that you’ve read this article. A language that you thought was too difficult for you? A language that everybody says is impossible to learn and don’t even give it a shot? I want to know! Happy language learning everybody! Greetings from Switzerland. A lot of people ask me how I learn languages. What are the first steps that I take? Well, in this article I want to tell you how exactly I go about my sweeties. 2. I get hold of a language course and listen, read, work through the textbook and do grammar drills. I want to stress the fact that I do little grammar, I prefer listening and speaking. 3. I learn the most basic verbs to get started and conjugate them. For this I usually buy a book where I can find all the conjugations I need. I write them down and combine them with other words I’ve already learned. 4. I listen an awful lot. This helps me to get used to the rhythm of the language. For me that’s a key factor. I learn grammar by listening, mostly, I don’t like strictly grammar based approaches. When we learned our first mother tongue when we were children, did we do grammar exercises? No, we listened and through this activity we learned grammar. I listen to podcasts, YouTubers, interviews and other sources of audio input. 5. I make a lot of mistakes. Now, you might strive for perfection, but in language learning perfection doesn’t exist. There’s always more to learn. I myself strive for perfection, but to reach such a high level you have to make an awful lot of mistakes. It takes years to get to a level of perfection. I’d say after having lived 15 years in a country, you might have reached a native like level, unless you’re a beast and learn extremely quickly. But for most people, it takes years. It is impossible to not make mistakes. Let’s suppose your learning Japanese. Japanese has a completely different word order, so you will automatically make a lot of mistakes, although you’re trying not to. The language you’re learning is not yours yet, you’re not familiar with the grammar rules, so you will end up making mistakes and run across disappointments. Don’t be afraid of making mistakes, it will happen and it’s absolutely normal. I try to make as many mistakes as I can. Of course, I don’t want to, but it’s a natural process. The more mistakes you make, the better you’ll get. 6. I revise the words that I’ve learned on a daily basis. I like to use a little book where I write them down and before going to sleep I read them out loud. Not only do I jot down words, no, I always like to see words in a context. So instead of just writing down the raw words, I create sentences. Luca Lampariello, my greatest inspiration, talks about the fact that only uttering or learning just one word is not the way it works. You have to see the word in a context. ,,Context is absolutely king in language learning”, he says. He also stresses the fact that reading is extremely important when it comes to learning a language efficiently. By reading you don’t only focus on one word, no, you see the whole and you’re basically applying the technique I just revealed, which is to see words in a given context. Check out his blog, you can read the article in English and German. 7. When I completed half the language course, or earlier, depending if it’s a language of the same language family as my mother tongue or to a language that I’ve already learned, I start talking to native speakers. At that stage, I’m still working with the book but mostly I spend time talking to native speakers or asking them how you could say this or that. I write down sentences and words that I think are important. 8. I vary my activities. Not only do I learn with books, no, with audio input, watching YouTube videos, watching movies, reading but most importantly I talk to people in their language, even though I make a lot of mistakes. I might also play Habbo in various languages, which is a virtual world, basically like Sims, where you can chat to improve your skills. Today I want to write a little something about my opinion on who’s the greatest polyglot alive. Now, I think that language learning is not a competition. Sadly, there are some people who think that they’re competing with others, but in my opinion this is nonsense. Language learning, if you ask me, is about having fun and discovering a whole new culture, a whole new world through people we meet. There is no number one. However, there’s a lot of great polyglots I admire. They’re my inspirations and without a doubt each and everyone unique. They use different techniques as to how they learn their languages. I would like to introduce you to the world of polyglots in this article. The order of the following polyglots is random and does not say anything about them. They all speak at least 9 languages. In fact, Moses Mccormick claims to have studied over fifty. If I forgot you, that doesn’t mean that you’re not a great polyglot whatsoever. Each and everyone of us can be a polyglot. Those are all the polyglots that came to my mind that one can find on YouTube. Now, choose a few and keep watching their videos. You’ll learn a lot! If you really want to, you can be the next hyperpolyglot, and maybe you’ll end up being listed or mentioned here one day. I think we all agree that, when learning a language, one has to use a book or at least a pencil and a piece of paper. At the initial stage, this is necessary. Now you might say that you only want to listen to a language and learn words by listening, but I think orthography plays a huge role, especially when learning a language with another writing system. If you like soccer e.g. why don’t you watch an interview of Cristiano Ronaldo in Portuguese? It’s a great way to combine your vocabulary that you’ve already learned with a song! I don’t recommend rap, unless you’re at a advanced stage. That’s what I love to do. Knowing more about cultures and accents is interesting! You can even find your future wife or husband from the country where the language is spoken. Combine your knowledge with fun videos or movies. I myself have watched ‘Finding Nemo’ in over seven languages. If you’re learning French, I’d recommend ”Normanfaitdesvidéos” and ”Cyprien” on YouTube. I had such a great time watching their comedy videos! Search for their names, you will not regret it! Read whatever you like. The best piece of advice I can give you is to read your favorite genre. Don’t read classics that you don’t like. Entertain yourself with texts that aren’t too complicated. Your attitude towards language learning is absolutely paramount. If you don’t have the right attitude, things might get difficult, even though it is absolutely possible to learn the language. In German, there’s a saying which literally translates into ”this seems like Spanish to me”, meaning that something is very difficult. If I had listened to all those people who say that, as a German native speaker, it is very difficult to learn Spanish, I would have never learned Spanish and never reached a B2/C1 Level. Apply this little anecdote to your language learning. Let’s say you want to learn Hungarian, Polish, Japanese or Mandarin Chinese. All these languages are conceived as difficult. You need to get rid of rumors and assumptions. Change your perspective. Instead of saying: ”I’m not even going to try to tackle Mandarin Chinese Characters and sounds”, change your attitude. It takes more effort to learn Mandarin Chinese, it’s true, but absolutely doable. You can master the hardest languages in the world by changing your attitude and by not listening to the naysayers. I wish you good luck with your studies and a wonderful day. Now, you might feel disappointed as you continue to learn a language. You might feel like ”gosh, this is boring. Why am I doing this. Man, now I’ve got to study again, this is tiring.” When you reach such a point, you have to remind yourself why you’re doing this. 1. Motivation: Think of the people you’ll meet when you have reached a level that is equal to a level high enough to talk to natives. Maybe you’ll find a girlfriend in this country where the language is spoken, amazing friends or even a wife! Think of the moments that you will have, but if you quit, you’ll end up not knowing amazing people and even more disappointed. 2. Patience: Being patient can be hard, but the truth is that you can’t learn a language in a matter of a day. It takes time. Be patient and enjoy the process. Instead of working on your language skills twice a month, do it regularly. With that approach, you can learn much faster. 3. Consistency: Do a bit every day. You need to feed your brain. You can learn one word a day, review all flashcards at the end of the week and eventually get fluent in a short period of time. 4. Discipline: The word says it all. Be courageous. 5. Time: One thing, and I can hear this very often, is that people claim to not have time to learn a language. The truth is, it’s not about not having the time but to make the time. There are definitively several time slots in your life that you can use to learn a language. Subscribe and never miss another post!